Moulds taken off original pipe fragments of Victorian pipes are used; therefore, I make accurate reproductions of clay tobacco smoking pipes. Because the original pipes used wax or varnish on the mouth piece, they are unhygienic. Therefore, I twice fire my pipes, glazing the mouth piece with ceramic glaze, giving a more hygienic pipe. Because of this Tinderbox sells clay tobacco pipes – hygiene and accurate reproduction from originals. Tobacco smoking pipes were made originally in metal molds or moulds – both spellings are acceptable, on a ‘gin’ press. The word ‘gin’ is an old English word for engine, a device. I made my gin press; therefore, you can purchase gin pressed pipes from this site! Example are: my hand-made Pakuranga Toasties, marbled pipes and earthenware white pipes. Not all my pipes are made this way , but I use a reproduction metal mold taken off an originally metal mold for some of my pipes. I make for the ceramics artist, potters and industry, based in Auckland, New Zealand, selling bespoke moulds. 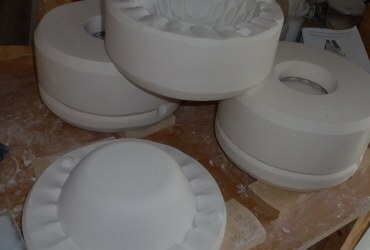 I do not stock plaster molds but make to order off customer supplied models. My preference is for new mold making: crisp new models which make crisp moulds. However, I am able to redeem molds by making new from damaged molds, with no model supplied. Whereby, you supply an existing damaged mold, I make new. This service is a ‘process of last resort’ for clients who don’t have models but have a mold, sometimes damaged. However, I make or repair some models too! 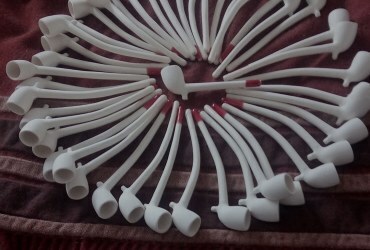 But I do not make clay pipe molds for sale. Founded in 2003, Tinderbox is in Auckland, New Zealand, the site of Richard Lees, Craftsman. 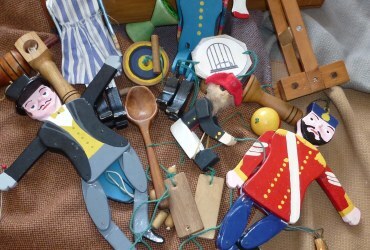 I make bessoms (traditional brooms), wooden spoons, pottery, leather items and turn wood on a pole lathe (foot driven lathe), as well as other craft items. Postings of these can be seen on his facebook page.